It’ll be a short one tonight, but since I’ve been discussing zombies and things that can go wrong with brains, how about a quick blogmas post on a fungal infection that turns ants into zombies? Trying to come up with a topic, it was suggested that I just do a short write-up about a “strange disease”. The strangest disease that came to mind is not one that infects humans, though. The disease that came to mind is an odd affliction that can strike certain kinds of carpenter ants that live in warm tropical forests. They tend to live up in the trees, builging nests inside the trunks and branches. At night, they may emerge to somewhat ghoulishly scavenge the bodies of other insects to eat. 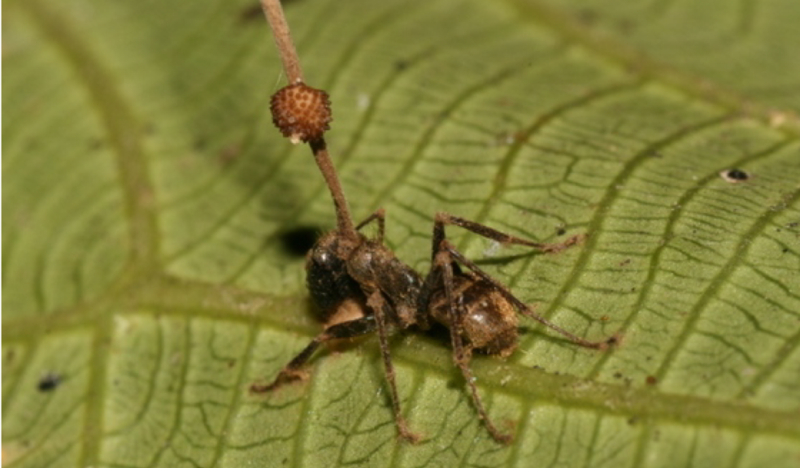 Sometimes these ants get a fungal infection from an organism called “Ophiocordyceps unilateralis“. What makes this disease so interesting is that it doesn’t just make its victim get sicker until it dies. Instead, O.unilateralis seems to exert an oddly specific kind of mind-control on the ants it infects. This fungus grows and reproduces best at a particular level of humidity and temperature. These are conditions found within a couple of feet of the tropical-forest floor. The ants usually live much higher up in the trees than this. The first thing the fungus does once it establishes an infection is to force a few convulsions in the ant. This makes it lose its grip and fall to the ground. Next, the fungus somehow forces the ant to find a plant that’s the ideal height. 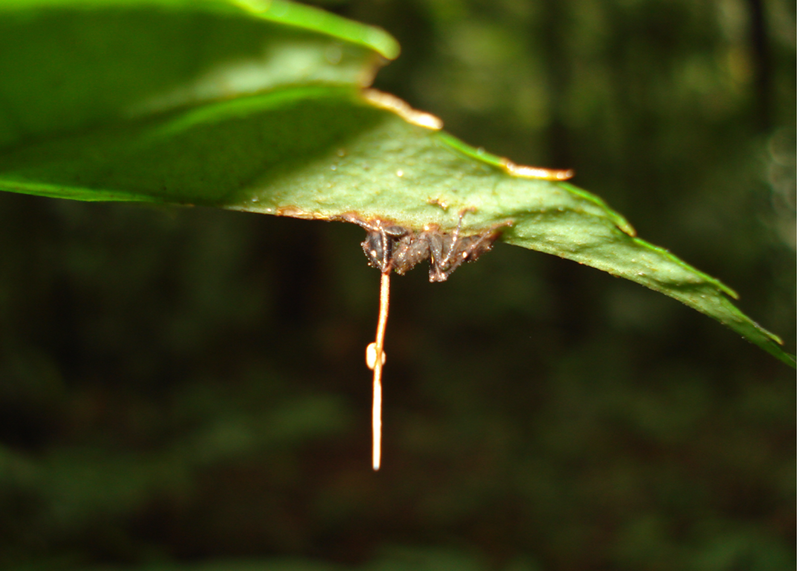 It forces the ant to climb up its stem onto the bottom of a leaf. Then it forces the ant to find the main vein of the leaf and bite down on it as hard as it can, never to let go again. Only then does the fungal disease run wild. It kills the ant and consumes the its guts to feed itself and grow. Tiny fungal tendrils (called mycelia) emerge from parts of the ant’s body. These grab hold of the leaf to keep the ant in place. Once the fungus has devoured the ant’s innards, it is ready to move into it’s spore-spreading reproductive phase. In one final grotesque act, the fungal growth bursts out of the ant’s head, its spore-spreading “fruiting body” waving in the breeze to spread its contagion to other unsuspecting ants. Unusual Symptoms, not just for Ants! Many illnesses can affect their host’s behavior in general ways. Being sick can make a victim want to sleep more often, or to feel irritable, but specific, complicated behavioral manipulation by disease isn’t very common. Don’t feel too complacent just because you’re not an insect. There’s at least one “mind-control” disease that can infect humans. In fact, in some places this disease may lurk in a large percentage of the population…but I’ll save that for another post.